Fox Business Network is poised to make its first real first venture into live news programming in prime time, and Trish Regan will be the anchor. Pun intended. 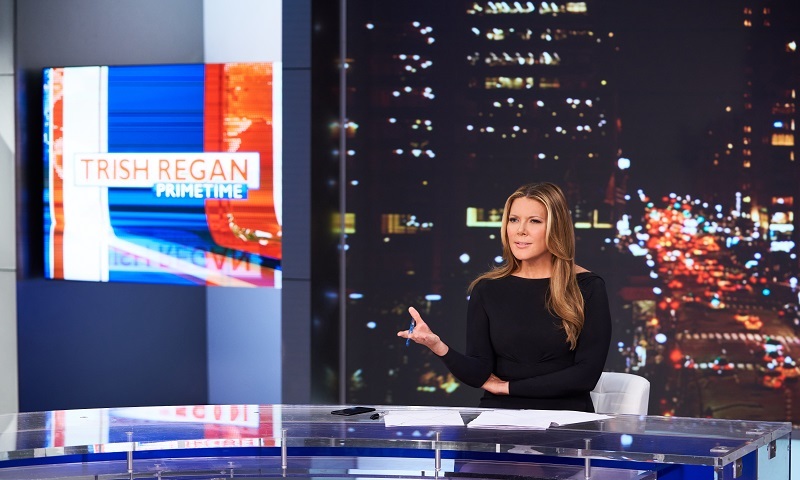 Trish Regan Primetime debuts tonight in the 8 p.m. ET hour. We spoke with Regan last week about the new show, changes at her company and the possibility of her moderating another presidential primary debate. TVNewser: You say this will be a news program. Your lead-in on FBN, Lou Dobbs Tonight is opinion. How will your show be different from his, while trying to maintain that lead-in audience? Regan: I’m a big believer in making sure that you always have both sides presented, and frankly I think it’s a more interesting and lively discussion from my own perspective as a viewer to see both sides. As an anchor, I want to make sure we’re exploring all angles on a story. The viewer can make up their own mind. Often I have an opinion, and when I have an opinion you’ll hear about it; I’ll make sure that you’ll know everyone else’s opinion too. That’s a big part of what I enjoy doing. I have said this before: I’m an Independent, I have voted for both parties. I’m not political, but I am policy-oriented and I am interested in the right moves for our economy, for our nation; but I’m also always willing to listen. I’m receptive to different ideas, and I want to make sure that the viewer has an open mind as well. Even if they don’t have an open mind, that’s OK, but if they can come away with learning something that they didn’t know before from the other side, that’s a good thing. TVNewser: Who should we expect to see on Trish Regan Primetime? Other FBN personalities? Guests that viewers are familiar with? There have been some leadership changes over there recently, with Brian Jones as president of FBN and Suzanne Scott CEO of both FBN and Fox News. Can you talk about them a little bit? I’m a big believer in diversity of one’s workforce, and diversity of opinion. From the perspective of a newsroom, it’s critical that we have different voices. You now have a woman, a working mother, and an African-American running these two major networks. I think it’s great. I can also tell you from personal experience that they’re really wonderful people. Brian has been such a force in my career in terms of helping me and believing in me. I have three little kids; twin girls who are eight and a son who is six. Both [Brian and Suzanne] are very family oriented. Suzanne, the first time I ever met her, was so welcoming. We sat down in her office and the first thing she wanted to know was: “How do you do it? How do you make it work?” What I will tell you is the corporation that you work for and the people you surround yourself with and who your bosses are and who your team members are a big part of how you make it work. So when I look at Brian, and I look at Suzanne, I just have two people who have believed in me from the beginning as a talent; but who have also understood all the complications of being a mom and taking on a prime time gig. What I have most admired about our leadership is that they never for two seconds thought I couldn’t do this because I’m a working mom. Fox Business skews on the older side for TV. (Per Nielsen, the network’s median age in prime time is currently 65+) Will you actively try to bring in a younger audience? Is there a social strategy in place? I am me, and I can’t really be anything but me. I don’t really think I’m all that hip! You have to go to Kennedy for that. There’s not really a strategy of: “Oh, we’re going to bring in young people!” I have always been of the mindset that you program the best you can. You put on the best darn show you can possibly put on with your own ability and your own authenticity, and to me, viewers follow. That may sound kind of hokey and pollyanna, but the truth is that’s all you can do. You moderated the 2016 GOP primary debate. If the DNC reached out to FBN about a potential Democratic Party debate, would you be interested in moderating? Absolutely. 100 percent, I would love to moderate a Democrat debate. FYI, I come from a family background that was very active in the Democratic Party. My uncle was the two-time gubernatorial nominee for the Democratic Party against John Sununu in New Hampshire. I’ll qualify that by saying that New Hampshire, where I grew up, is a state that has, I think, the best motto going: “Live Free or Die.” That motto has guided a lot of my principles. A conservative in New Hampshire still doesn’t want their taxes going up! With that said, it’s in part what inspires me always to be incredibly fair. I’ve grown up around both sides. I understand both sides and I may have a view on it, but I want the viewers to reach their own conclusions.